Among the huge number of periodical chess publications there are very few that have such standing and popularity that it makes them almost irreplaceable for chess players. But even among those happy few, Dutch-based New In Chess (NIC) is certainly a unique chess publication. Not one, but two publications, taken together, form the fundamental basis of NIC's world of chess information. New In Chess Magazine, issued eight times per year, brings internationally important chess news, tournament reports, interviews and chess articles on a wide spectrum of subjects. New In Chess Yearbook, issued quarterly covers the most important opening novelties, fashionable modern systems, new ideas in well-forgotten opening lines of the past, and everything else that could help chess players in their opening preparation. Both magazine and yearbook are published in the English language and are the indisputable leaders in international chess news and chess theory. During this past year we have seen important changes in the NIC system. Starting with issue 62, the NIC Yearbook assumed a significant new look and concept. In addition many new features appeared at the newinchess.com website, one of the most important being the new online database launched in September. So, we had many reasons to seek an interview with René Olthof, who is directly involved in work on both publications - as Yearbook Supervisor and as Magazine Editor. We are pleased that, despite his busy schedule, René found time to answer our questions. Mikhail Golubev (MG): A little history - we know that Schaakbulletin, a magazine in Dutch, was the direct predecessor of the Magazine that emerged in the middle of the 1980s. Whose idea was it to launch the Yearbook and who was involved in the project from the very beginning? René Olthof (RO): The Yearbook was an integral part of the original NIC concept. In 1983 the New In Chess Keybook was published, an encyclopaedic analysis of current opening theory 1970-1982. The Yearbook was conceived as a yearly update. Believe it or not but the initial idea was launched by the staff of Sahovski Informator (Matanovic, Milic, Bozic, Molerovic) and implemented by Elsevier, the Dutch publishing house. Remember this was well before the ascent of the personal computer. 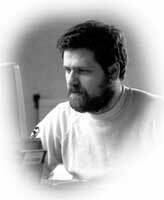 NIC was the first to use mainframe database technology in chess publishing. The Dutch programmer was called Helmer Wieringa. Early on in the project Willem Andriessen was asked to join. MG: Many people, who worked in the NIC team, have become well-known in the chess world. But there is still a paradoxical exception - we hardly know anything about Willem Andriessen, your publisher. Could you please tell us something about him and his involvement in chess? RO: It is true that Mr. Andriessen is better known in the Netherlands than abroad. He participated in the Dutch Championship only once: Leeuwarden 1971. In the late sixties he founded Schaakbulletin together with some friends. Its rise to fame started when first Timman and then, in 1973, Sosonko joined the magazine. Other famous contributors were of course Hein Donner and Tim Krabbé. Andriessen was the centre of this extremely talented bunch of people. Later he was also in charge of the most influential weekly chess column in de Volkskrant, a nation-wide daily newspaper. His predecessor was Donner. Ligterink, his successor, still holds this job. MG: Is it still possible to find (and buy!) the first issues of the Yearbook? RO: The first 16 issues of the Yearbook and the Keybook have been sold out with us for quite some time. However, Im sure that if you search the chess bookshops and antiquarian bookshops around the world you should be able to find them. From issue 17 onwards we still store and sell. MG: On the front cover of Yearbook 62 there was Michael Adams' face. That was the first photo in the Yearbook ever, which was followed by photos in this and the subsequent issues. It also seems that the Opening Surveys, the main Yearbook section, contains more text now than in the past. Would it be accurate to say then, that NIC Yearbook is developing a "humanistic" approach? RO: Absolutely. We try to be as user-friendly as possible for our readers. The human touch is a key element in this policy. Provide optimal guidance to the reader. MG: How much has chess theory changed since the pre-computer era (i.e. since the 1980s)? Is chess theory, the main subject of the Yearbook, something that still belongs to us, humans? RO: It is clear that the rise of the computer has had an enormous impact on chess theory, but perhaps less so than people tend to think. Let me single out two aspects. A nice example of the changes the computer has brought dates back to the 1991 Candidates' match Speelman-Short, held in the City of London in the offices of Watson, Farley and Williams. For the first time in his life Short played the Grünfeld. And what a success it was! After a mere 10 moves the first match game was effectively over. He repeated this three time during the match and scored 2,5 out of 4. Afterwards he played the Grünfeld once in Debrecen 1992, only to abondon it ever after. Without the computer such daring behaviour would have been highly erratic but nowadays surveying new opening lines or indeed entire openings and collecting all available information about them has become far less time-consuming, so experiments like Short's become less and less irresponsible. Another side of the coin. In Yearbook 59 Hungarian IM Tibor Karolyi wrote a lengthy and incredibly thorough survey on the Polugaevsky Variation called 'Questions About 10.exf6'. But it took somebody of the stature of Peter Leko to come up with this fantastic novelty 20.Rxb4!! from his game against Ghaem Maghami, Erevan World Team Championship 2001. I would say there is still hope for mankind! MG: One of notable additions in the Yearbook was the new reviews section, where Grandmaster Flear is the main reviewer of opening books. Another British GM, Matthew Sadler, earlier started to write his interesting reviews for the Magazine. Has NIC started to pay more attention to chess books in general? RO:In the Magazine we have always paid attention to high-level book productions. Just think of the columns of Hans Ree. Speaking about the Yearbook, opening books are an important part of the current theory. So if you want to cover major developments and want to explain to the reader what is happening in opening land, it makes sense to review the latest publications. In general you can say that the advent of the computer has increased the quality of opening books but again, it's the human input that makes the difference. Two of the recent books I like best are Play the Open Games as Black (Gambit 2000) by John Emms (enormously helpful for club players) and Französisch: Winawer (Chessgate 2001), an incredible production in German by Stefan Kindermann and Ulrich Dirr on 7.Qg4 0-0 in the Main Line Winawer. MG: The NIC statistic section is one feature that no longer exists in the Yearbook. Of course, we also noted above that the NIC database has now become available online! Is there any connection, and what would be the major difference between the NIC database and other databases that are available online? RO:There is no connection, except that now everyone can find statistics on any variation with NICBase Online. Contrary to many others we strive for a quality database without duplicate games and a pleasant and easy interface. Judging from the reactions of the public they like NICbase Online. MG: We noticed that the NIC Archives (which includes titles and descriptions of all the previous NIC publications - ed.) was another recent innovation at Newinchess.com. Does NIC plan to start other new electronic chess projects? Will NIC continue the CD publications series? RO:At this moment we are focusing on printed editions and investing a lot of time and effort in them. So, youre more likely to receive new printed publications from us than CD publications though we dont exclude the latter. Let me use the opportunity to explain to your readers that in the NIC Archives they can find reference to any article and any opening survey that has ever been published in New In Chess Magazine or the Yearbook. It was an enormous job to prepare! RO:We are sponsoring the Email World Championships that are organized by the ICCF. At the moment the first and second championships are going on in different stages. I dont believe Timmerman is participating but I am not entirely sure. We supply subscriptions to the Yearbook as prizes as well as money prizes for the best game analyses, which we happily use for the Yearbooks. The first samples can be appreciated in Yearbook 64. Amazing discoveries! RO: If we take the October 2002 FIDE-list you would have to go to number 25 and 26 to find a top player who has never contributed to New In Chess. But then the youngsters Krishnan Sasikiran and Vladimir Malakhov (both 2670) have plenty of time to do so in the future. Wunderkind Sergey Karjakin already did! As for the Dutch players - there is nobody above 2500 who hasn't, so I guess the answer must be Sipke Ernst, who will make his debut in the Dutch team at the upcoming Olympiad in Bled. How did the NIC team celebrate the victory of the Dutch Team at the 2001 European Team Championship? RO: As a matter of fact we didn't. Except for soccer and speed skating, the Dutch are not particularly known for their nationalistic sentiments. NIC is an international magazine without a special bias towards or against certain persons or countries. Alexander Baburin (AB): How did you start in chess? RO:By playing off hand games at home against my older brother Ivo, who is a club player of reasonable skill. I joined a chess club only at the age of 14 when my table tennis career had come to an end. AB: What do you like most in chess? RO: The international character of the chess world. I believe that FIDE has the second largest number of affiliate member states after the world soccer body FIFA. AB: What brought you to chess publishing? AB: What do you like and what do you dislike about your work? RO: I'm not much of a disliker. I like the privilege of being able to work in the chess world on a professional basis despite the fact that I am a rather weak player myself. AB: What is your biggest desire in chess? RO: To continue winning nice games with the Sicilian Dragon! MG: One rumor has it that René Olthof spends a few days of the week at home, and some days in the NIC office, in another town. Can you confirm or refute this? How does your typical week (and day) look like? RO: This rumour is true. I leave my home town of 's-Hertogenbosch (a beautiful medieval city in the province of Northern Brabant with a magnificent gothic cathedral) Monday morning and I return Thursday night. In between I work full time at the office in Alkmaar, 40 kilometers northwest of Amsterdam. MG & AB: Thank you René!